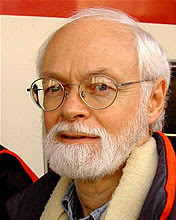 What can we do? Start by educating people in your own sphere of influence as "Paul Revere" did. Talk to your family, friends, neighbors, local officials, and to people on the internet. 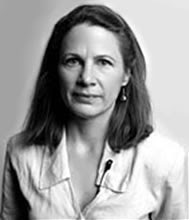 Call hometown newspapers and tell them that you have a story that makes Watergate, the Iran-Contra Affair, and the false claims of WMD's appear like traffic violations. We owe this to the thousands of veterans who have died defending freedom for our children, ourselves, and generations yet to come. 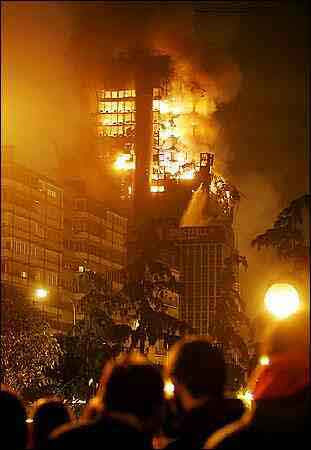 Please, do not let our generation be the one to have allowed evil forces to take our precious freedoms away. 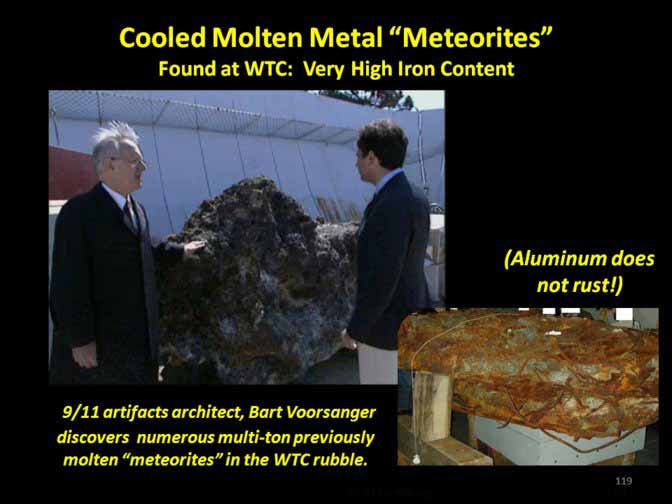 One very important aspect of the destruction of the World Trade Center that has been completely omitted by the controlled media is the presence of huge amounts of molten iron seen before, during, and after the explosive demolition of the Twin Towers. 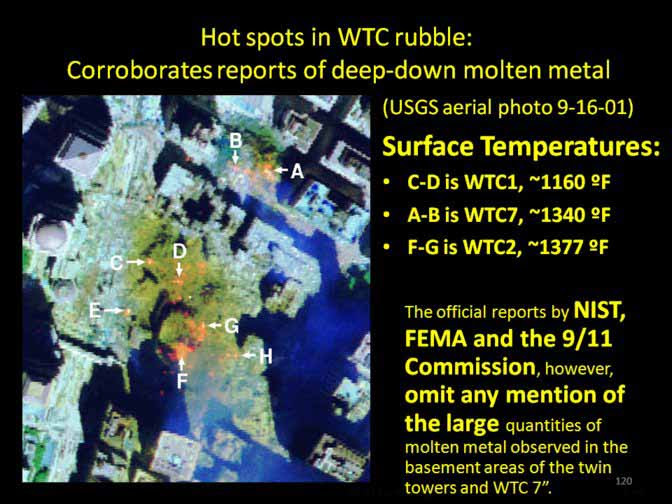 Molten metal was seen in television footage falling from the South Tower before it was destroyed, observed by firemen and professional contractors in the rubble, and found in large quantities in the form of tiny iron spheres in the dust of the demolished towers by independent and government scientists. 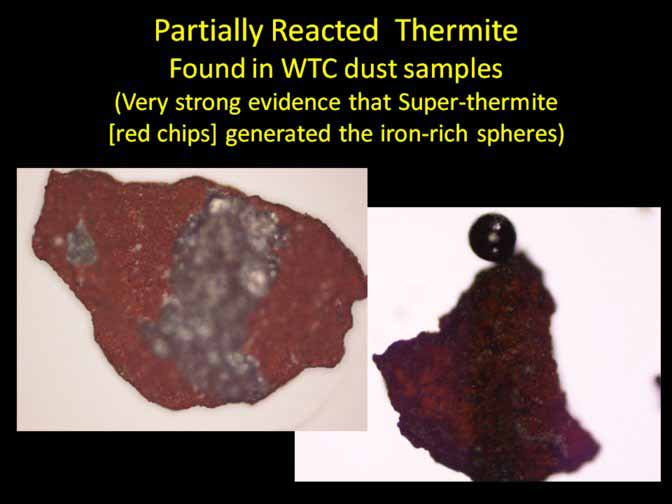 The tiny iron-rich spheres are, in fact, so commonly found in the dust that their presence is called a signature characteristic of WTC dust, which means it is an identifying characteristic of the dust. 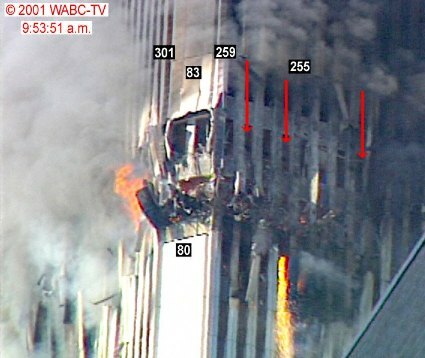 Extremely hot molten metal, presumably iron, was seen cascading from the 81st floor for seven minutes before the tower fell. 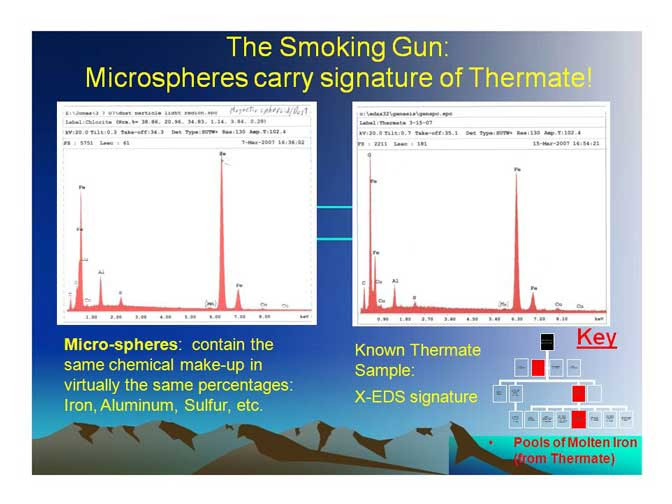 A large thermitic reaction was seen one minute earlier occurring in the same place. 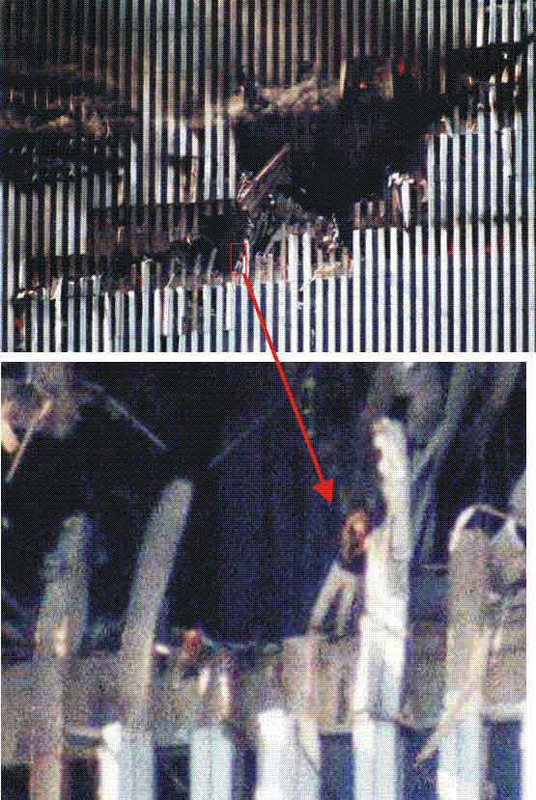 A huge cascade of molten metal, presumed to be iron, can be seen falling from the 81st floor of the South Tower for about seven minutes before the tower fell. 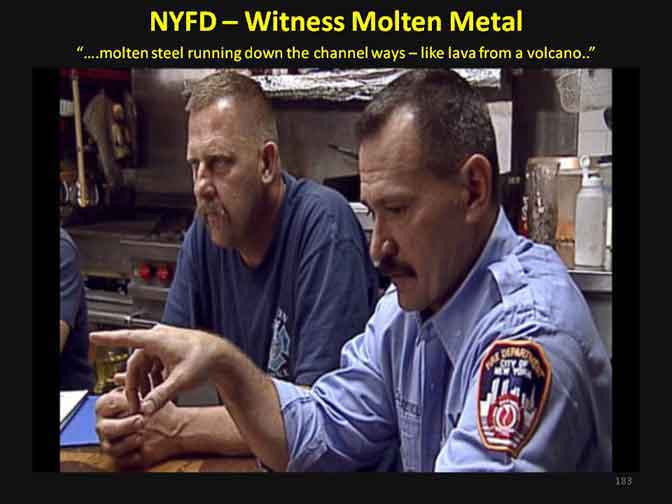 Firemen reported seeing "molten steel" flowing in the rubble pile "like a volcano" while contractors reported finding pools of molten iron, in the molten state, beneath all three collapsed towers when they reached the bedrock of Manhattan. 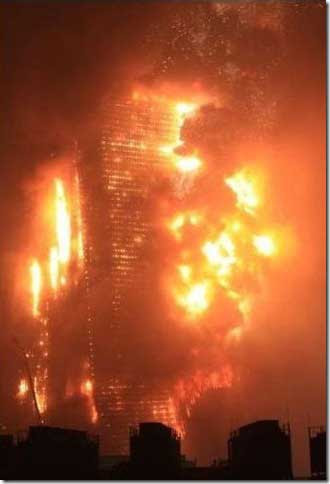 Firemen and contractors reported seeing "molten steel" in the rubble. 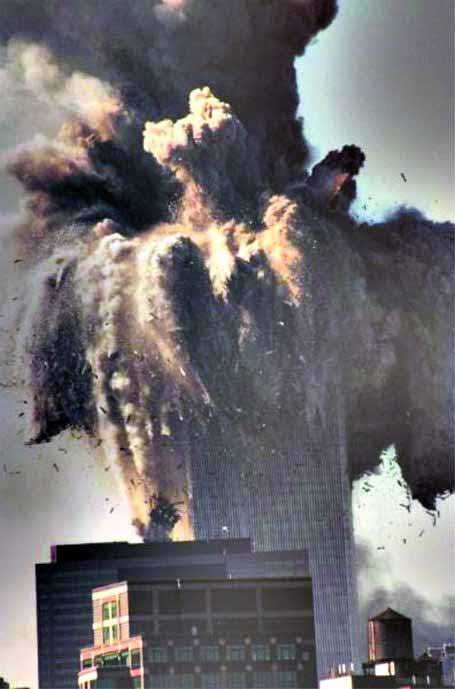 The demolition of the Twin Towers evidently involved energetic and explosive materials that created billions of tiny balls of iron. 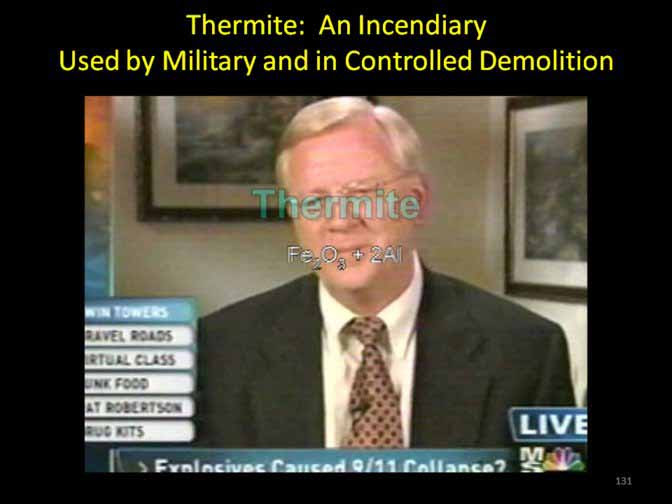 Chips of a highly energetic nano-composite of thermite were found in the dust by Dr. Steven E. Jones, a discovery that was documented in a peer-reviewed paper published in 2009. 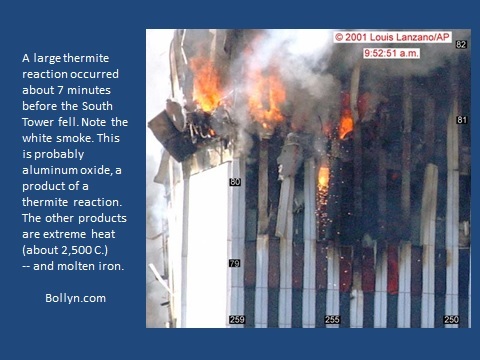 When this thermitic material was heated to 430 degrees C, it detonated and released a great deal of heat and produced tiny balls of iron. 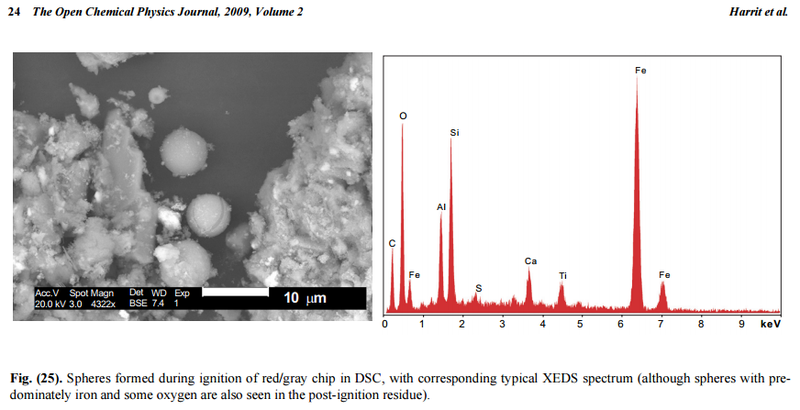 This energetic explosive material appears to have been the source of the tiny iron spheres found in the dust. 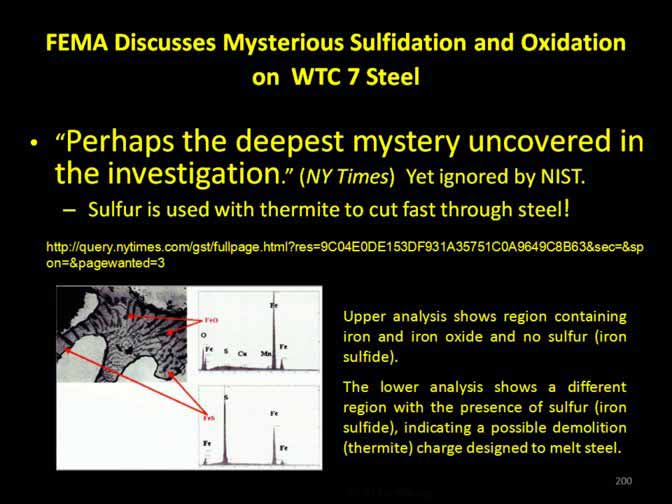 The bi-layered active thermitic material found in the dust of the World Trade Center by Dr. Steven E. Jones, et al. 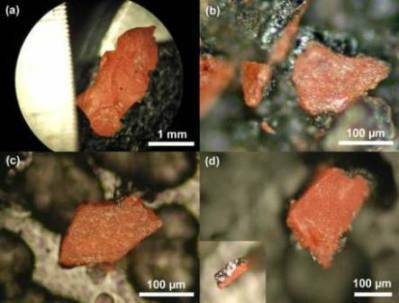 When the thermitic material was heated to 430 degrees C it detonated, creating intense heat and tiny iron-rich spheres identical to those found in the dust. 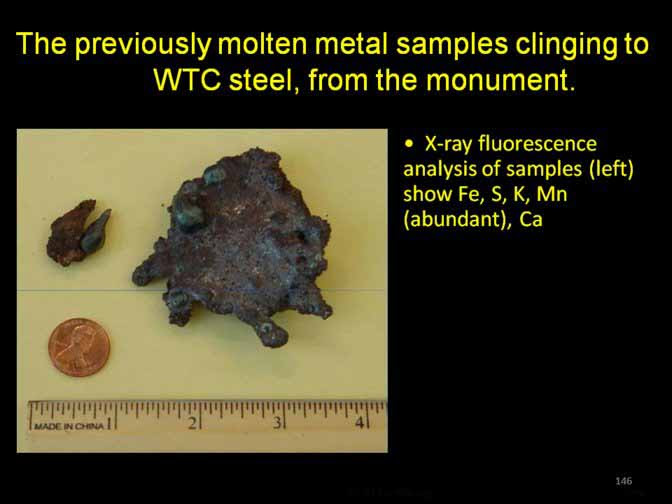 Source: "Active Thermitic Material Discovered in Dust from the 9/11 World Trade Center Catastrophe", Steven E. Jones, et al. 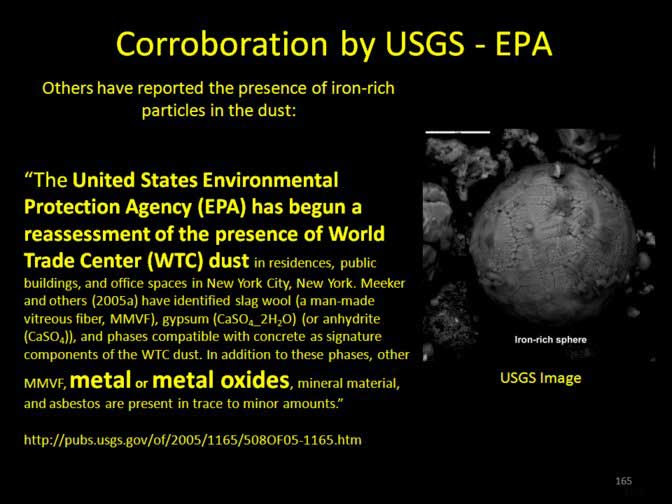 These "iron-rich spheres" were documented in every study of the dust, both government and private, but never reported by the mainstream media. 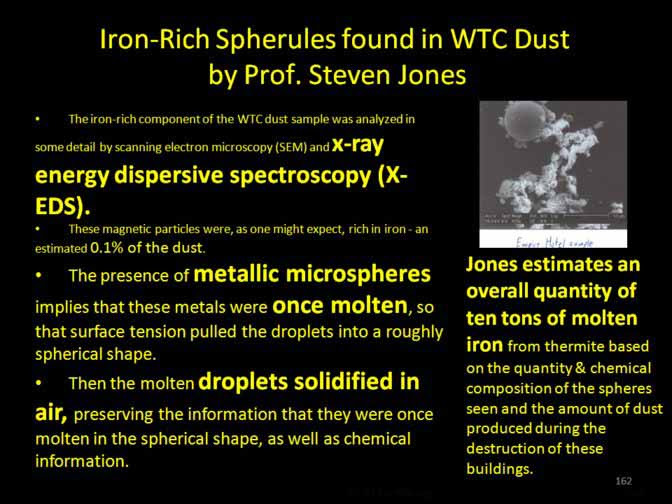 The R.J. Lee study of the dust in the Deutsche Bank building at the southern edge of the World Trade Center complex found that iron spheres comprised nearly 6 percent of the dust. 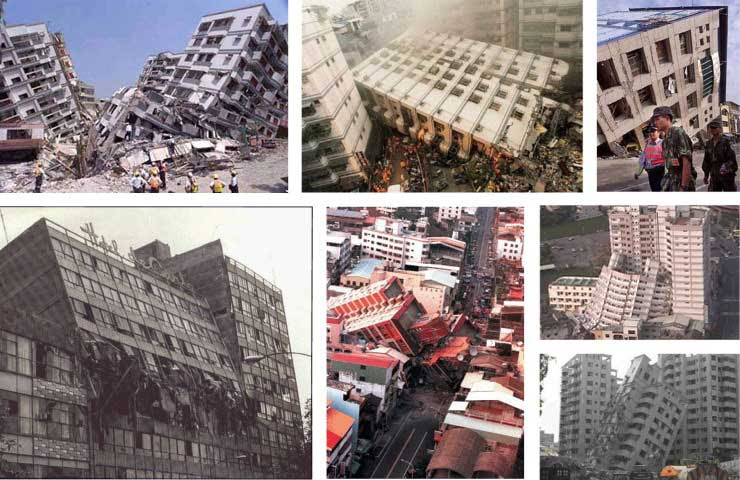 The U.S. Geological Survey's (U.S.G.S.) 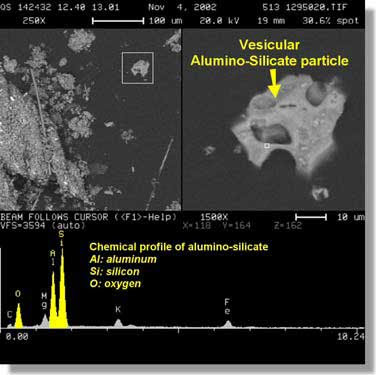 Particle Atlas of World Trade Center Dust includes high-quality micrographs of these tiny spheres and chemical analysis of their composition. 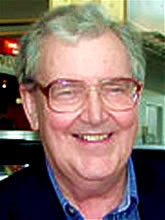 The U.S.G.S. 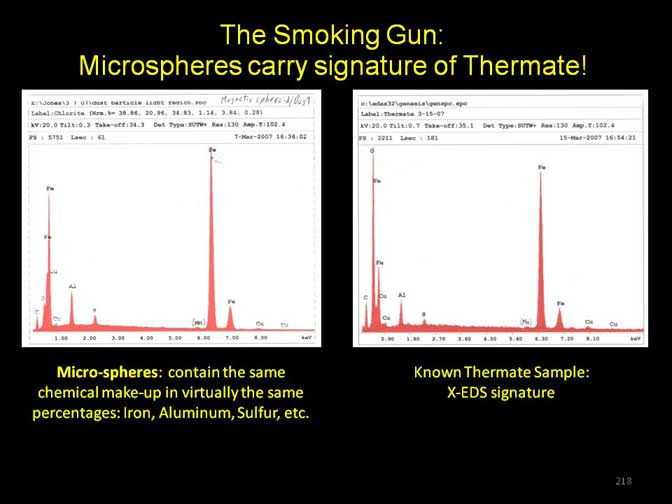 survey also discovered spheres of molybdenum which were not included in the print version. 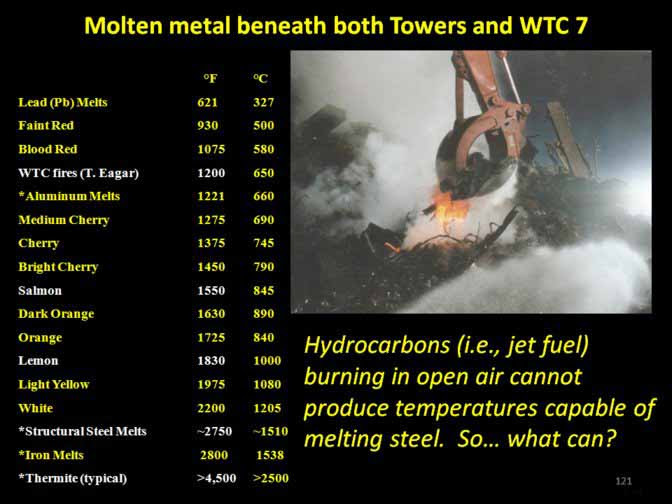 It should be noted that molybdenum has a very high melting point of 2,623 degrees C, or 4,753 degrees F. These spheres of molten iron and molybdenum are proof that the demolition of the towers was much hotter than the government claims. 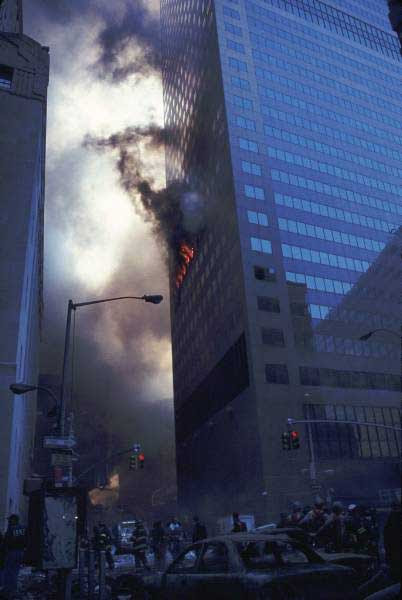 The first evidence of large amounts of molten metal, presumably iron, was seen falling from the 81st floor of the South Tower seven minutes before it fell. 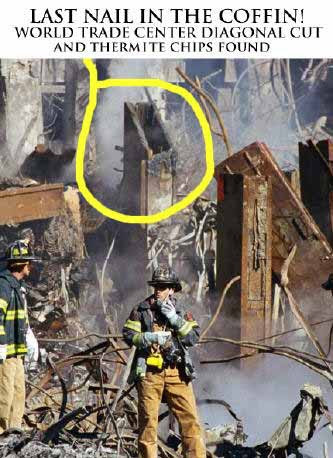 Firemen and contractors working on the pile reported seeing "molten steel" running through the rubble and in pools beneath all three collapsed towers. 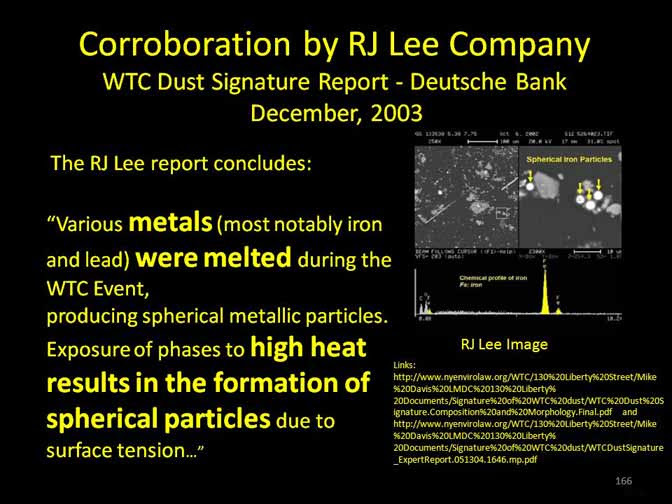 The R.J. Lee Group analyzed the dust found in the Deutsche Bank building and published their report on the composition and morphology of the dust in December 2003, in which they reported that iron spheres comprised nearly 6 percent of the dust. 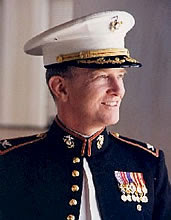 The U.S.G.S. 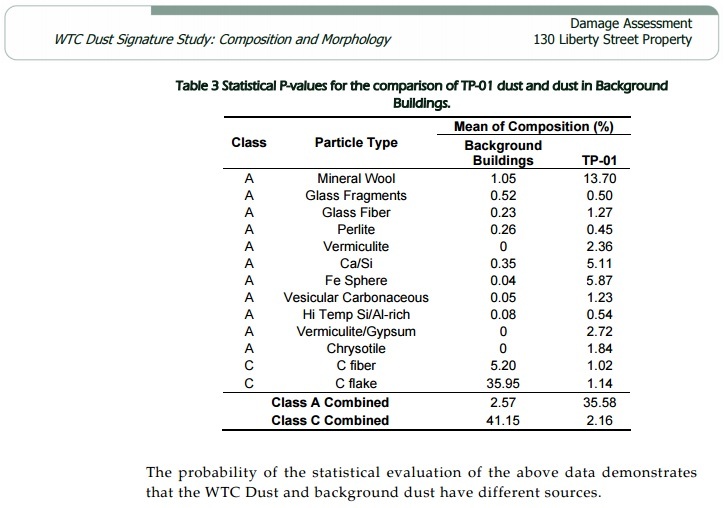 published the Particle Atlas of World Trade Center Dust in 2005 in which photographs of the iron spheres were included. 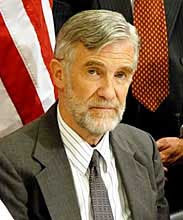 In 2006, there were only two copies of the Atlas available in the entire state of California. 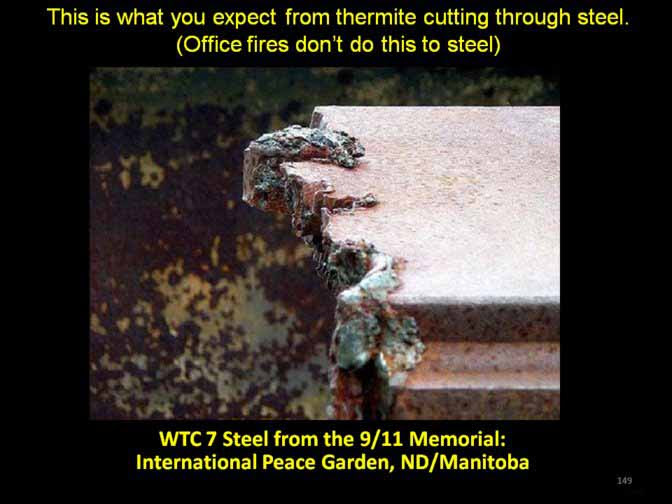 Fortunately for me, one of them was in the science library at the University of California at Davis, where I was doing research on the dust and smoke of the WTC destruction. 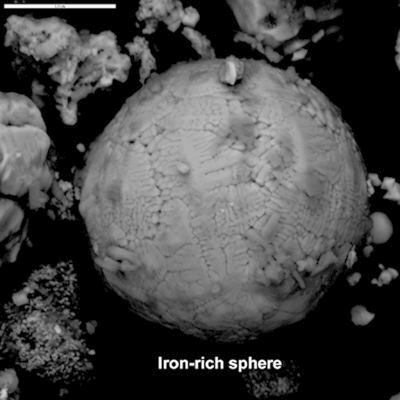 The R.J. Lee study of the dust found iron spheres comprised nearly 6 percent of the dust. That is a very large percentage and can not be explained by the official explanation. 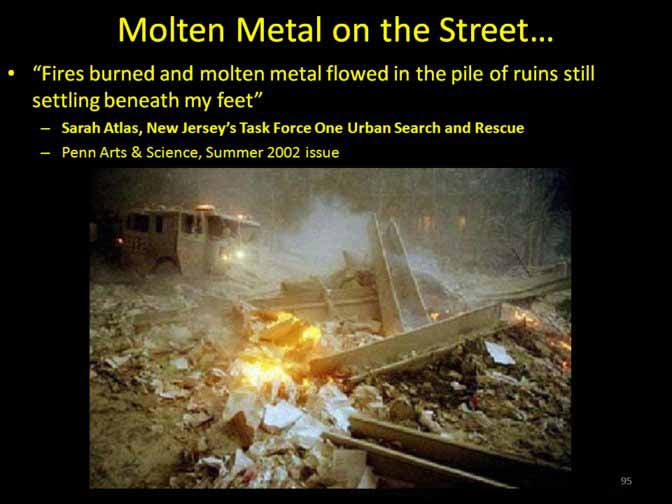 While 9-11 researchers were aware of these discoveries the general public was not simply because the mainstream media censored any discussion of it. 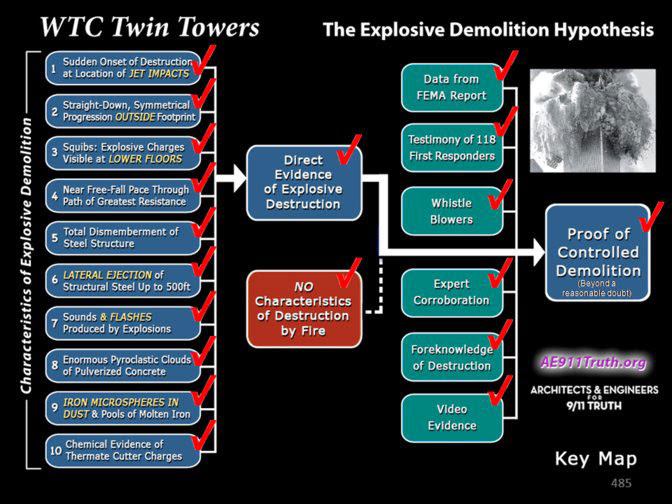 So, why have these fundamental discoveries of forensic evidence pertaining to the destruction of the Twin Towers, in which some 2,700 people were killed, not been reported by the mainstream media? 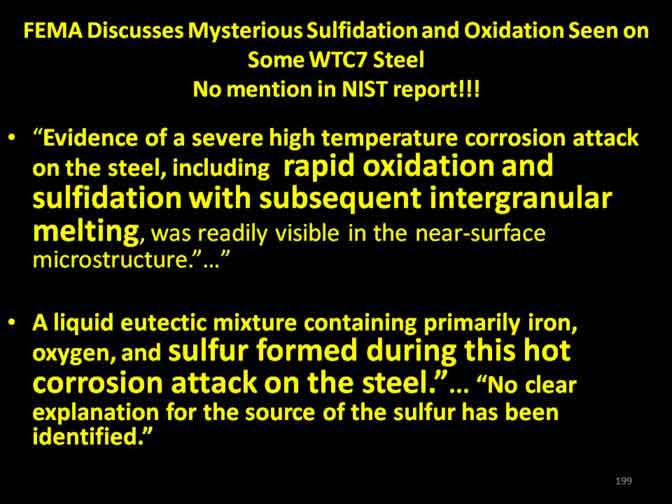 The evidence of molten iron and other metals had to be omitted from the government and media explanation because its presence completely contradicts the official narrative of 9-11. The government story falls apart when this evidence is presented, so the controlled media has simply omitted any mention of it for the past fifteen years. 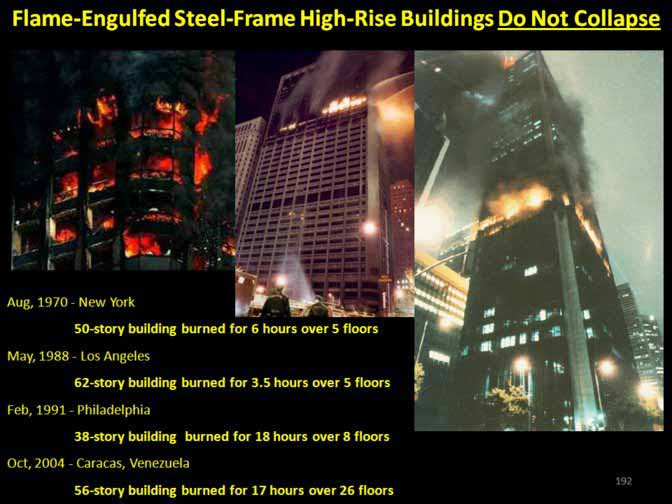 This omission was intentional because the evidence of large amounts of molten iron in the towers and rubble destroys the official narrative. This narrative had to be protected because it is the false story the public was sold in order to get public opinion to support waging the Global War on Terror. 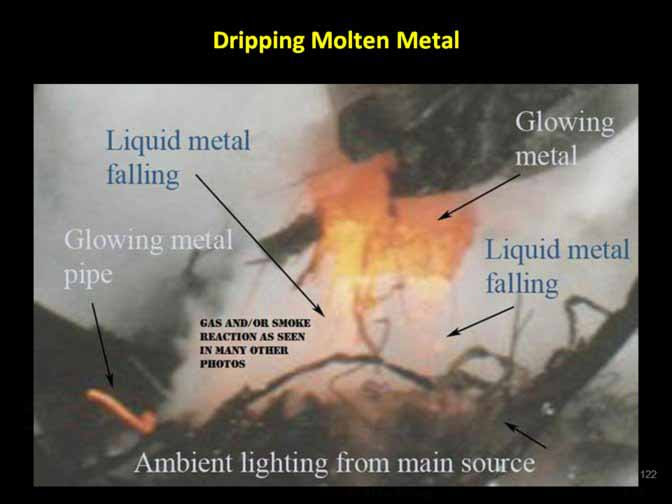 The evidence of molten iron contradicts that story, so information about it had to be withheld from the public. 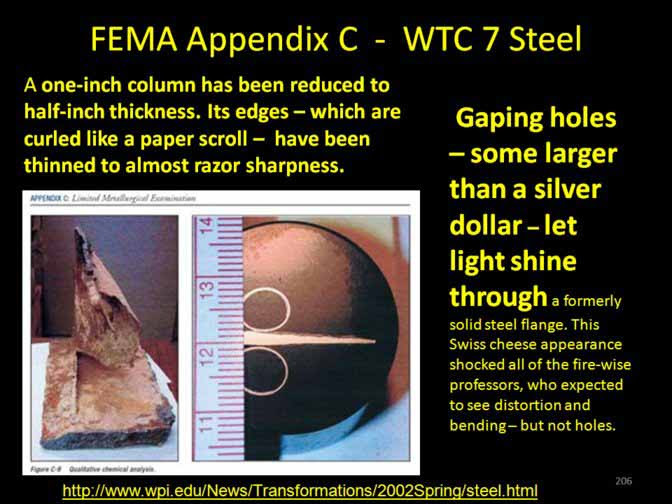 If the media had informed the public of the huge amount of molten iron in the Twin Towers when it was first seen and every time its presence was re-discovered, the entire public understanding of what happened on 9-11 would have been different, and the motivation for waging war in Afghanistan and Iraq would have been completely derailed. 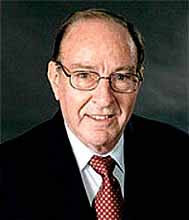 The media's betrayal of the American people and the republic in this regard is unforgivable. 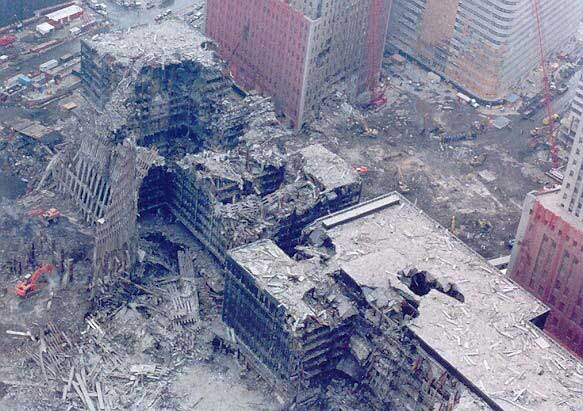 The people who conspired to keep this information from the public should be investigated and charged with complicity in a conspiracy to wage a war of aggression, a crime against the peace.